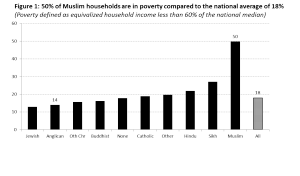 Home » Blogposts » How can we explain the high Muslim levels of poverty? Poverty is a much more common experience among Muslims than other religious groups in the UK. 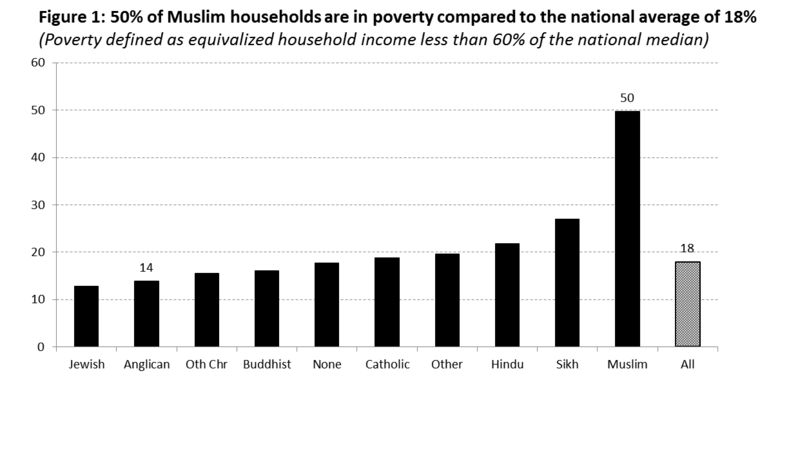 Figure 1 shows that 50% of Muslim households are in poverty compared to the national average of 18% (estimates based on data collected between 2009 and 2011). One of the perennial problems in social science is how to deal with confounders. We know that poverty is more frequent among people of Pakistani and Bangladeshi origin (see here), and most within these ethnic groups identify as Muslim. So is this an ethnic rather than a religious phenomenon? To answer this question, we looked at data from the UK Household Longitudinal Survey which has a large sample size and therefore enough variation to disentangle religion from ethnicity. In Figure 2, in the Muslim column you can see poverty rates of white Muslims, Black African Muslims, Indian Muslims, and so on, whilst reading across the rows shows, for example, the poverty rates of Indians who identify as Christian, Muslim, Hindu and so forth. This simple analysis shows that, on the whole, those identifying as Muslim are more likely to be living in poverty than the average for the ethnic group overall (the exception is Pakistani). This suggests that there may be something about the religion, not just the ethnic group, that is associated with poverty. How can we explain this? We came up with three theories. The first is transitory factors, which is to say that Muslim groups are more recent arrivals to the UK and as such may have lower levels of education (or foreign qualifications that aren’t recognised), and are less likely to be proficient in English – these factors directly influence labour market outcomes. A second explanation might be intrinsic factors to the religion, for example, particular family values may mean lower rates of women going to work and larger family sizes. The third explanatory theory is prejudice and discrimination. We used a statistical method that enables us to see if there is a residual effect of being Muslim on poverty after accounting for the transitory and intrinsic factors (employment status, language skills, household size, education and so on) as well as confounders (ethnicity). The results showed that even after taking these possible causal factors into account, Muslim households have a greater chance of being in poverty than all other religious groups by 7 percentage points (this is a sizeable effect, recall the national average of 18%). Having ruled out other explanations (as best we can with the available data) we think the residual effect is likely to result from the third explanation, prejudice and discrimination, suggesting that these are having real measurable consequences for Muslim groups in British society. Other research into attitudes towards Muslim migrants supports this explanation, although more evidence is probably needed before we can reach a firm conclusion. This paper was presented by Prof Heath at an event last week at the Oxford Centre for Islamic Studies. Have a look at the slides here, or read the more in-depth article co-authored by Prof Li at the University of Manchester. The Centre for Social Investigation is taking on a new project to test for Muslim discrimination more directly, we’ll post news about this new and exciting project in the coming months.